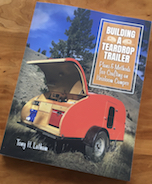 Teardrops n Tiny Travel Trailers • View topic - Should I Use The Foam Gaskets Or Ditch Them For Caulk??? Should I Use The Foam Gaskets Or Ditch Them For Caulk??? So I'm in the final stages of waterproofing all my accessories on my teardrop. I have used Dynaflex 230 to waterproof my deck ports for the AC and my Fantastic Fan and noticed that my exterior flood lights and 30amp power plug both come with what looks like a cheap foam gasket. Now to me this seems like a problem waiting to happen if I use they're cheap foam to waterproof vs. ditching them and then making a gasket (so to speak) with the Dynaflex 230. Just would like some opinions as soon as possible please on what you would do and why, thanks!!!!! Re: Should I Use The Foam Gaskets Or Ditch Them For Caulk??? My experience with caulk, particularly that designed for RV's is that it is designed to fail (my opinion). This is formed by how easy it is to remove even with good surface preparation. I am currently using Lexel and judging by how hard it is to remove ( I goofed) and one years leak free it works. I'm curious as to why no one uses silicone. Specifically GE Silicone II unless you need an adhesive bond (no screws or anything holding it). Granted it's a bit messy if you dont know how to work with it but it outlasts about anything. And clear. Easy cleanup is keep disposable rags and isopropyl alcohol ready, cleans it right up if it's not fully cured. Tigris99 wrote: I'm curious as to why no one uses silicone. Specifically GE Silicone II unless you need an adhesive bond (no screws or anything holding it). Granted it's a bit messy if you dont know how to work with it but it outlasts about anything. And clear. I stay away from silicone because nothing will ever stick to it. Not latex caulk, not glue, not paint. It doesn't offer any advantages as an adhesive or a sealant that you can't get done with something else. If you decide later you want to apply something on top of the silicone you just can't. Even if you scrape it off the traces of residue of cured silicone prevents adhering anything else. RTV silicone rubber is a fabulous material in thousands of applications, but I don't use it on my trailer. I stay away from silicone because nothing will ever stick to it. Silicone won't' stick where silicone has been... My silicone days are done.